Andy Brown is a major leaguer who'll score with aficionados and casual listeners alike because he respects the compositions while presenting his own take on a tune. His choices are astute and any jazz guitarist would enjoy an evening appreciating his artistry while his or her date would just enjoy the good music. Brown is smart and savvy like Les Paul and Armstrong who'd always lay the familiar in the listener's lap as a constant reference point for his improvisations...Highly recommended. Andy Brown perpetuates the legacy of great Chicago guitarists with this fine collection of standards all reharmonized with fingerstyle flair. Like Joe Pass, Brown plays solo guitar employing bebop rides, melodic minor runs and walking bass lines. In short, he's a comprehensive and creative soloist and with just occasional exceptions his choices are interpreted sans pick. First tune of the set is an aptly romantic rendition of Irving Berlin's "Dancing in the Dark" followed by a spirited version of "Stompin' at the Savoy" with a walking bass line juxtaposed against imaginative improvisations. This is bonafide jazz and each offering is complete unto itself but the guitarist always presents us with the melody. In addition to Pass' influence Brown says he was mentored by the late, great Kenny Poole who was one of jazz guitar's best and most unique players. Those of us who knew Kenny felt like we were in on a big secret and it's nice to see him get recognition here by another fine player. In addition, in the liner notes Brown cites his admiration of Ted Greene, George Van Eps, Cal Collins, Lenny Breau and Howard Alden. Other highlights include the too often overlooked, "O Barquino" (Little Boat), "Nina Never Knew," "When Your Lover Has Gone," complete with its little known verse. Brown switches to the pick just for Godchild." "Drum Boogie" is unusual and fun and Van Eps' "Tango El Bongo" is no doubt a shout out to GVE's 1960s records. These are studio recordings but the session in essence reproduced what you'll hear Brown play on a gig. He had audio engineer Scott Steinman keep the tape rolling as he went from tune to tune, all spontaneous choices. Other standouts (they're all excellent) include "Estate,`" "It's the Talk of the Town," "By Myself" and "Memories of You." Andy Brown is a major leaguer who'll score with aficionados and casual listeners alike because he respects the compositions while presenting his own take on a tune. His choices are astute and any jazz guitarist would enjoy an evening appreciating his artistry while his or her date would just enjoy the good music. Brown is smart and savvy like Les Paul and Armstrong who'd always lay the familiar in the listener's lap as a constant reference point for his improvisations. Brown crafts a consistently alluring performance. The rubato opening, the artful embellishments, the sleek improvisations, the subtle comping, the sparkling harmonics that light up the coda: All add to this opening cut's lyricism and charm - so much so, in fact, that there are times when the familiar refrain, or a light-fingered variation, seems to be dancing in mid-air. 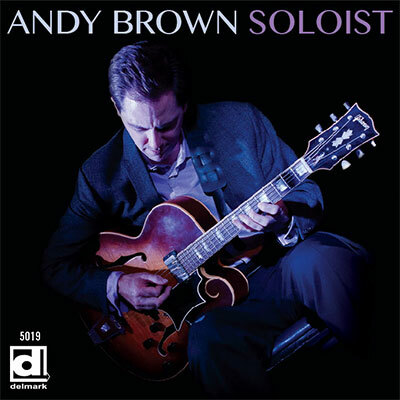 When programming the selection of tunes on his latest CD, Soloist, Chicago-based guitarist Andy Brown couldn't have chosen a more enticing opener than his finger style take on "Dancing In The Dark." Or a more telling one, for it certainly suggests pleasures to come. Introducing the standard with an articulate and elegant touch, Brown crafts a consistently alluring performance. The rubato opening, the artful embellishments, the sleek improvisations, the subtle comping, the sparkling harmonics that light up the coda: All add to this opening cut's lyricism and charm - so much so, in fact, that there are times when the familiar refrain, or a light-fingered variation, seems to be dancing in mid-air. Brown counts Kenny Poole, Ted Greene, Cal Collins, and Lenny Breau among his many inspirations, and their influence, whether subtle or striking, is felt throughout the album. Case in point: "Tango El Bongo," a winning salute to its composer, the late seven-string guitar legend George Van Eps. Its title notwithstanding, the tune is a showcase for serious musicianship. Following the master's lead, Brown adroitly shades or punctuates the now sunny, now soulful theme with basslines and chordal tints. Apart from a robust take on George Wellington's "Godchild," this is a strictly finger style affair, brimming with pop and jazz classics. Yet Brown's nimble dexterity and an abundance of imaginative, mostly off-the-cuff arrangements keep things interesting. Of course, when you're dealing with a solo jazz guitar album that features romantic Latin excursions and a wonderfully evocative reprise of the Gene Krupa-Roy Eldridge swing anthem "Drum Boogie," perhaps that goes without saying. Fingerstyle specialist Andy Brown brings a wealth of stylistic range and technical ability to his first solo-guitar outing. Impeccable as it is, his technical prowess is surpassed by a keen sense of tuneful improvisation, making the date a particularly joyous affair..."Soloist" is that rare date where every take is a pleasant surprise. Fingerstyle specialist Andy Brown brings a wealth of stylistic range and technical ability to his first solo-guitar outing. The tidy takes - only three of the album's 14 tracks exceed five minutes - allow the guitarist to demonstrate his mastery of a variety of idioms, from boogie to bossa and beyond. Brown's clean, effortless style, regardless of genre, is what constantly impresses. Impeccable as it is, his technical prowess is surpassed by a keen sense of tuneful improvisation, making the date a particularly joyous affair. The program focuses heavily on familiar melodic gems that are recognized jazz and Tin Pan Alley standards, plus two bossa nova lovelies and a few stylistic curveballs. One is drummer Gene Krupa's "Drum Boogie," on which Brown has some fun with his blues-oriented chops. "Godchild," a tune by early bebop pianist George Wellington, is the only performance on the program where Brown uses a pick, and it results in a particularly driving and rhythmically loose-jointed take. Despite its fanciful title, guitarist George Van Eps' "Tango El Bongo" wouldn't seem out of place in a classical guitar recital. The take is the only one on the date that was arranged in advance by Brown, and the formality of his approach further demonstrates his extensive skills. "O Barquinho," the '60's-era Brazilian hit, is a festive, up-tempo eruption of bossa rhythms, while "It's The Talk of the Town," a nearly forgotten ditty from 1933, is cast in a sentimental mood. The finesse with which Brown lays down bass lines as he spins off single-note and chordal improvisations is remarkable, as is his use of dynamics and shifting tempi. "Soloist" is that rare date where every take is a pleasant surprise. Chicago-based Andy Brown is 40 years old - meaning that some of the songs here were popular decades before he was born, as well as illustrating his maturity, along with the fact that he's done his homework....Brown is comfortable and authoritative on ballads, uptempo numbers, and Latin grooves...Brown achieves a tone that is warm but round, with plenty of definition. The effect is intimate, as though Brown is giving a masterful private concert in your living room. Chicago-based Andy Brown is 40 years old - meaning that some of the songs here were popular decades before he was born, as well as illustrating his maturity, along with the fact that he's done his homework. Some of Brown's studies were with Cal Collins, Ted Greene, his chief mentor Kenny Poole, and Howard Alden, with whom he recorded 2013's Heavy Artillery, following his 2007 debut, Trio and Solo.He also cites as influences Joe Pass, Lenny Breau, Ed Bickert, and George Van Eps, whose "Tango El Bongo" is featured, beginning with a smooth Latin feel before delving into the more complex harmonies Van Eps was known for. Brown is comfortable and authoritative on ballads ("When Your Lover Has Gone"), uptempo numbers ("Stompin' At The Savoy), and Latin grooves ("O Barquino"). He even proves that "Drum Boogie," Gene Krupa's big-band classic, can sound self-contained sans drums. Playing his '65 Gibson Tal Farlow through a '65 Fender Vibrolux, Brown achieves a tone that is warm but round, with plenty of definition. The effect is intimate, as though Brown is giving a masterful private concert in your living room. Chicago clubgoers know Brown from his prolific appearances as headliner or sideman in all the city's major rooms, where he stands as an understated player who lets the music speak for itself. By the very nature of this solo recording, however, Brown for the first time basks in a spotlight he thoroughly deserves. Playing alone on a recording — and sustaining listener interest through 14 tracks — poses considerable challenges, and Brown addresses them with grace and aplomb. Chicago clubgoers know Brown from his prolific appearances as headliner or sideman in all the city's major rooms, where he stands as an understated player who lets the music speak for itself. By the very nature of this solo recording, however, Brown for the first time basks in a spotlight he thoroughly deserves. Playing alone on a recording — and sustaining listener interest through 14 tracks — poses considerable challenges, and Brown addresses them with grace and aplomb. For starters, there's the sound of his playing: warm, full and resonant at all tempos and in various moods. Indeed, Brown packs so much melodic, harmonic and rhythmic information into each cut that one very nearly forgets a single instrument is at play. Taking on mostly jazz standards, he brings forth ample poetry in "Dancing in the Dark" and buoyant forward motion in "Stompin' at the Savoy," gently undulating rhythm in "Estate" and lovely intermingling of melodic strands in "By Myself." If "Soloist" stands as a kind of tour de force, that's due to its innate musicality more than to Brown's ultrasleek, seemingly effortless technique. Andy Brown is a superior mainstream guitarist...a closer listen reveals plenty of subtle creativity....the playing is fairly spontaneous with the uptempo "Drum Boogie" and a lyrical "Memories Of You" being among the high points. A fixture on the Chicago jazz scene since 2003, Andy Brown is a superior mainstream guitarist. "Soloist" features Brown performing 13 standards plus George Van Eps' "Tango El Bongo." In the liner notes Brown cites the inspirations of Kenny Poole, Van Eps and Howard Alden, and one can hear a bit of Joe Pass in his approach. Unlike Pass, Brown only occasionally plays a bass line, emphasizing his single-note runs punctuated with occasional chords. While some of the music, particularly the ballads, can be viewed as relaxing background music, a closer listen reveals plenty of subtle creativity. Fortunately many of the performances are taken at a hotter medium-tempo pace. Other than the tightly arranged Van Eps piece, the playing is fairly spontaneous with the uptempo "Drum Boogie" and a lyrical "Memories Of You" being among the high points. In his liner note essay, Brown mentions ten guitarists he admires, some of them famous (Andres Segovia, Joe Pass, Chet Atkins), others heroes in the guitar community who are barely known to general audiences (Kenny Poole, Ted Greene). Having absorbed the work of all the players he credits with inspiration, Brown makes it plain that he has internalized their lessons and shaped an individual approach. Reminiscent of George Van Eps in terms of masterly chording and avoidance of technical display for its own sake, he has a distinctive way of integrating bass lines in his improvisations. He plays fingerstyle on all but one of the 14 pieces. "Stompin' at the Savoy" is a prime example of his swing, "Nina Never Knew" of his lyricism. Brown is not widely known beyond Chicago and environs. This album may change that. Andy Brown makes music, first and always. His music woos the ear and the brain but lodges deep in the heart...Soloist is a love letter to beautiful songs played with affection and swing, and it is easy to listen to without being Easy Listening. It would impress any harmonically-astute guitar whiz but it could also embrace someone who knew nothing about substitute chords. Andy Brown knows and embodies the simple truth. It's not how many notes you can play: it's how you convey feeling with those notes. For some time, the guitar has been the most popular instrument on the planet. Many guitarists aspire to blazing technique that causes the fretboard to burst into flames. If you like to blame people, you can blame Hendrix, Bird, or even Django, masters who suggested to the unwary that the way to be even better was to be faster, more densely aggressive. I come from a different school, having heard Charlie Christian, Teddy Bunn, Herb Ellis, Barney Kessel, Mary Osborne, George Barnes, George Van Eps and others early in my development. I cherish deep simplicities, not fireworks. That is why I have delighted in the playing of Andy Brown and am especially entranced by his most recent CD, plainly named SOLOIST (Delmark Records). Andy Brown makes music, first and always. His music woos the ear and the brain but lodges deep in the heart. You shouldn't get the wrong idea about him from my somewhat reactionary description: he is no primitive, rejecting technique because he has none. On the contrary, he can play quickly, elaborately, and dramatically when the music calls for it. The most mature players know that the greatest displays of technique involve restraint, subtlety, and breathing space. Andy understands this, and what you hear is a relaxed lyricism where every note counts. He is a melodic improviser, someone in love with beautiful warm sounds, not trying to impress listeners with outlandish dramatic spectacle. Andy sounds like himself, but if I were pressed to say what ancestral heroes his playing suggests, they wouldn't be guitarists. Rather, I think this CD would have made Bobby Hackett, Ruby Braff, and Count Basie grin, for its understated singing grace, its beaming pleasure in music-making. Andy's idols are many — he explains all that in his delightfully understated liner notes — but this isn't a homage to any one guitarist. It isn't a disc where the artist reproduces and then elaborates on an influential album or set of recordings. SOLOIST is a love letter to beautiful songs played with affection and swing, and it is easy to listen to without being Easy Listening. It would impress any harmonically-astute guitar whiz but it could also embrace someone who knew nothing about substitute chords. And although most of the songs are "standards," they are played as if they were just written. Their melodies shine through; they swing. And — unlike many solo guitar recordings I've heard — the sound is plain, unaltered, but gorgeously warm. I see that the engineer is Scott Steinman — we are no relation — and he has done a lovely job. And all I can say is that when I began listening to this disc, I delighted in it from first to last and then it seemed the most natural thing to start it up again. You will feel similarly. SOLOIST is a lovely recording, and an accurate record of the music of someone I admire, having heard him in person. Andy writes in his notes that he simply began to play in the recording studio as he would on a gig. That should give any motivated person in the Chicago area a good idea: see Mr. Brown live and buy several copies of the CD from him. The reading of these 14 standards showcases his lyrical virtuosity at its best, as he reinterprets them with deft elegance without wandering far from their original essence... His lithe and sophisticated flourishes shimmer with quiet romanticism. Brown is a master of understatement, exposing the emotional core of the music without resorting to overt melodrama...He crafts superb, multilayered performances without the need of orchestral accompaniment. Guitarist Andy Brown's intimate Soloist is, as the title indicates, a set of unaccompanied tunes to which Brown brings his personal touch. Indeed, the reading of these 14 standards showcases his lyrical virtuosity at its best, as he reinterprets them with deft elegance without wandering far from their original essence. For instance, on violinist and saxophonist Edgar Sampson's "Stompin' At The Savoy," Brown's exuberant refrains roll spontaneously around the main melody, infusing it with a delightful sense of rhythm. Elsewhere, Brown reshapes and remolds the harmonic elements of guitarist George Van Eps' "Tango El Bongo" with agility and subtle but definite sensuality. His lithe and sophisticated flourishes shimmer with quiet romanticism. Brown is a master of understatement, exposing the emotional core of the music without resorting to overt melodrama. The languid version of Cole Porter's "Anything Goes" is mellifluous without being saccharine. Moreover, he crafts superb, multilayered performances without the need of orchestral accompaniment. On the classic "You're My Everything," a sunny disposition marks his up-tempo and luminous improvisation. Simultaneously, he tempers softer tones on Bruno Martino's passionate "Estate" with a hard-edged, swinging touch. The guitarist creates intriguing contrasts within each tune. The soulful arrangement of drummer Gene Krupa's "Drum Boogie" features crisp, funk-infused lines that build a thrilling inner dialogue with languid and long phrases. Meanwhile on the lilting "Nina Never Knew," Brown's intricate cascade of sparkling notes weaves a complex and engaging solo that alluringly complements the lullaby-like simplicity of the song. Brown's fourth release as leader/co-leader may be seen as an homage to legendary guitarist Joe Pass' Virtuoso albums. Brown does not derive his style, however, from Pass or anyone else for that matter. It is, singularly, his voice. Soloist may not share Pass' records' innovative ingenuity, but it is nevertheless inventive, charming and poetic. It certainly makes for an enjoyable and satisfying listening experience. This is a fine new solo guitar album from our member from Chicago Andy Brown. Andy has a unique and fluid solo style and this debut solo album I rate very highly. This is a fine new solo guitar album from our member from Chicago Andy Brown. I have previously reviewed two other CD's from Andy which have shown the depth of his talent both as accompanist to his wife vocalist Petra van Nuis and as a guitar partner to Howard Alden. This new album is his first as a solo player and you can hear the influence of George van Eps and Joe Pass. Andy's solo playing has also been influenced by Kenny Poole, Cal Collins, Ed Bickert, Lenny Breau and Howard Alden. Andy is very much in the mainstream style and his excellent choice of tunes reflect this. He uses his fingers thoughout except for "Godchild" where he uses a pick. "Godchild" is one of my favourite tunes and this is the first time I've heard it as a solo piece. All the tunes except for George van Eps' "Tango El Bongo" were spontaneous and loosely arranged. Andy has a unique and fluid solo style and this debut solo album I rate very highly. It is the best solo jazz guitar CD from a non-regular solo guitarist I have heard since Jim Fox's "Sunburst" from 2004. Maestro Brown is impeccable on this recording, giving us some incredibly convincing, very sophisticated and subtle examples of what the finger style can be. All I can say is that you need to hear this. Sure, most of us, maybe even all of us can never hope to get to this level with the style. That of course is all the more reason to hear him on this album. It's sheer guitar heaven! Do not miss it. Face it, as a musician you have two ways to go when you hear playing that at any point in time you could not possibly attempt given where you are in your playing. You can either reject the music contemptuously, maybe with anger, as not being worthy of your attention, or you can appreciate the artistry all the more. I saw Larry Coryell years ago at the Bottom Line. After a particularly finger-busting flourish he ended the tune and, looking out at the audience, commented, "I see a lot of frowns out there. Many of you must be guitarists!" I have always been of the camp that applauds what I cannot possibly do, learns something of the other possibilities out there by hearing such things, and welcomes the challenge of the in-executable! That does not mean everything you hear that you cannot reproduce yourself should become your next goal. There is something for that but time is finite so at a certain age you accept that you cannot be all things. Yet there is joy in hearing a real artist excel at something most difficult. Such an example glowingly presents itself on guitarist Andy Brown's recent album Soloist (Delmark 5019). I don't know much about him but just hearing the first few minutes of this album and eventually the whole thing tells you all you need to know. Andy is a consummate master of the solo guitar finger-picked style. The album consist of just him and his electric guitar. And that's all he needs. Very few players past or present can match his prowess in this style. He runs through a series of mostly standards, supplying richly inventive chordal comping, a hint of a bass line, the melodic essentials and lively solo segments. The style comes out of past masters such as George Van Eps (see recent review of an excellent reissue of his recordings on these pages) and, as Andy mentions in the liners, a rather obscure player by the name of Kenny Poole. Joe Pass comes to mind as well when he was in a solo zone. Playing solo is no small feat, and Brown is one of the best, providing both the rhythm and lead parts. At times, you'd even swear that you were listening to two guitarists, instead of only one. Splendid. As an amateur guitarist, I'm in complete awe of jazz guys like Andy Brown. While listening to "Soloist," my first thought was to remark at the fluidity of his playing. Almost simultaneously, I realized the thousands of hours of playing and practice time that it takes to achieve those heights. While this album of standards may have been recorded on a frigid January night in Chicago, there is warmth to spare. As Brown rambles his way through "Stompin' at the Savoy" and "Anything Goes," you might swear he is seated right in front of you, playing in your own living room. Brown plays in a snappy finger style, plucking his melodies from among passing chords and nifty arrangements. Playing solo is no small feat, and Brown is one of the best, providing both the rhythm and lead parts. At times, you'd even swear that you were listening to two guitarists, instead of only one. Splendid. Perhaps some of you elders remember a category in the Downbeat jazz polls with the title "Artist Deserving of Wider Attention." Well, I would think that guitarist Andy Brown would be a serious candidate in such a poll. Here he is on the distinguished Chicago label Delmark Records, playing a collection of wide-ranging titles with a perfect and respectful tone, tons of musical ideas brewing constantly under his hands, and overall an album that any serious guitarist should love hearing. Perhaps some of you elders remember a category in the Downbeat jazz polls with the title "Artist Deserving of Wider Attention." Well, I would think that guitarist Andy Brown would be a serious candidate in such a poll. Here he is on the distinguished Chicago label Delmark Records, playing a collection of wide-ranging titles with a perfect and respectful tone, tons of musical ideas brewing constantly under his hands, and overall an album that any serious guitarist should love hearing. His choices run the gamut. From the swing charts come "Stompin' at the Savoy," "Talk of the Town," and "Drum Boogie." Jazz choices include "Estaté," "Godchild" and O Barquinho" (aka "Little Boat"). Great standards also dot this musical map: "Dancing in the Dark," "Nina Never Knew," "Anything Goes," "When Your Lover Has Gone," "You're My Everything," "Memories of You," and "By Myself." Brown's purity of tone and endless ideas take me back to some of the outstanding albums from guitar virtuoso Joe Pass. Andy Brown is certainly deserving of widest attention. How about yours? Guitarist Andy Brown's nimble touch, lightly-amplified sound and good taste in repertoire are evident immediately on Soloist, a formidable collection recorded in a single evening...A pleasure from start to finish, and easily recommended. Guitarist Andy Brown's nimble touch, lightly-amplified sound and good taste in repertoire are evident immediately on Soloist, a formidable collection recorded in a single evening. Brown wisely told his engineer to keep recording, then went on to treat the studio session as if it were a gig so he could build a set in a way that seemed totally natural. Which is exactly what happened. Beginning with Irving Berlin's Dancing in the Dark, Brown wends his way through a choice selection of mostly standards with a few surprises along the way. George Van Eps' seldom played Tango El Bongo is a treat, and when was the last time you heard a solo guitarist tackle Gene Krupa and Roy Eldridge's Drum Boogie? It turns out that this happy riff tune lends itself quite well to a solo guitar treatment, at least when Andy Brown is playing it. Brown never loses sight of the melodies that he's playing, and he largely keeps things moving along smartly in the moderate tempos that he favors. A pleasure from start to finish, and easily recommended.